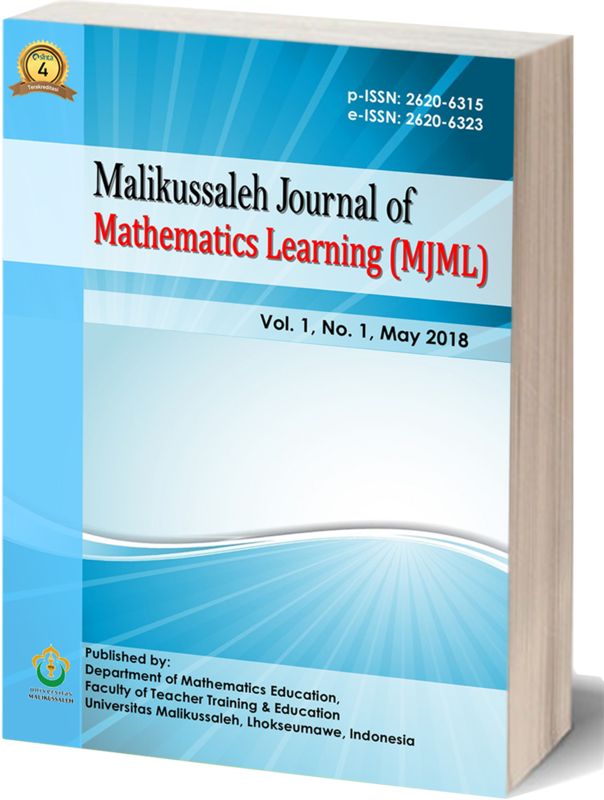 Malikussaleh Journal of Mathematics Learning (MJML) welcomes research articles, literature reviews, book reviews from various countries in the world that have high-quality on all topics related to mathematics education to publish in this journal. Submitted papers must be written in English for initial review stage by editors and further review process by minimum two international reviewers. This journal will be published twice a year in May and October managed by the Department of Mathematics Education of the Faculty of Teacher Training and Education and Published by Malikussaleh University. The articles should be original, unpublished, and not in consideration for publication elsewhere at the time of submission to the MJML. Every submitted manuscript to the MJML must be written in English and follow the Author Guidelines. Please read author guidelines. Before submission, please make sure that your manuscript is prepared using the MJML template. If the manuscript does not meet the author guidelines or written in a different format, the article will BE REJECTED. Only submitted manuscript that meets MJML format will be processed further. DOWNLOAD MJML TEMPLATE HERE. Proudly I announce you that Malikussaleh Journal of Mathematics Learning (MJML) has been Index in Microsoft Academic Search (MAS). It is impossible to get without your marvelous participation. Therefore we would like to invite you to contribute your best article to boost our journal reputation. Proudly I announce you that Malikussaleh Journal of Mathematics Learning (MJML) has been EVALUATED and ACCEPTED for inclusion in Directory of Open Access Journals (DOAJ). It is impossible to get without your marvelous participation. Therefore we would like to invite you to contribute your best article to boost our journal reputation. The Malikussaleh Journal of Mathematics Learning (MJLM) is an International Journal that disseminates research results in the field of mathematics education, such as on learning difficulties topics, learning outcomes, misconceptions, teaching, curriculum development, pedagogy, assessment, instructional design, instructional development, ICT in teaching, mathematical didactic, Seamless learning for math, Open Educational Resources for math, learning analytics, professional development of mathematics teachers, The mathematical work of teaching, teaching mathematics in multilingual classrooms or other relevant issue trends in mathematics education. We invite you to join us as a editorial board member and reviewer. DO YOU WANT TO BE A EDITOR AND REVIEWER ? Reviewers’ name and affiliation will be listed in the printed journal and on the journal's webpage as a member of editorial board and will be given electronic certificates. HOW TO APPLY TO BE A REVIEWER ?